The Kennett High School Blue and White Chapter of the National Honor Society welcomed the 2018-19 inductees at a ceremony and reception on April 4, 2018. The ceremony had been previously scheduled for March 21, but was postponed due to snow. Chapter adviser Dr. Alicia Tamargo opened the program. Four National Honor Society members from the Class of 2018 delivered speeches highlighting the Cardinal Objectives, the qualities expected of members: Maxwell Judd (character), Francesca Caccamo (scholarship), Claire Dawyot (leadership), and Erin Duffy (service). Senior speeches were delivered by Allison Taylor and James Rosser. Next, Mr. Jeffery Thomas, Assistant Principal, called the role of the existing members of the Chapter. These students were inducted into the Society last year: Ashton Albert, Leo Battalora, Jose Becerra, Tyler Bowdoin, Megan Bunke, Francesca Caccamo, Daniela Carmona, Clare Catanzaro, Hannah Church, Giulianna Claricurzio, Katherine Clarke, Anna Colamarino, Madelyn Conlin-Day, Michael Crognale, Jillian Curran, Abby Davidson, Claire Dawyot, Abigail Devestine, Kaitlyn Devonshire, Daniel Drennan, Abigail Duckworth, Erin Duffy, Nicholas Erni, Eliane Esparza Villarruel, Kevin Fiss, Melissa Fitzgibbon, Eric Gaver, David Geller, Victoria Gonzalez, Ryley Harris, Caroline Hertz, Sydney Holder, Nicole Huff, Quinn Huffaker, Alexa Hussey, Kelsey Jernegan, Cedric Jones, Benjamin Jordan, Delaney Joyce, Maxwell Judd, Jake Kalscheur, Brinda Kapur, Meghann LaCosta, Keiri Lemus Ramirez, Benjamin Lesher, Caroline Maroko, Matthew Patterson, Cameron Petrillo, Gianna Pippin, Elizabeth Rauscher, Lily Reilly, James Rosser, Katherine Rowe, Alena Rybarczyk, Jennifer Schaen, Morgan Schaen, Kathleen Schuetz, Linus Silbernagel, Elijah Smith, Lukas Staudenmayer, Samantha Sullivan, Allison Taylor, Emily Thompson, Madison Thureen, James Tuley, Citlaly Weed, Trinette Wheeler, Kaitlyn Willey, Chase Williams, Anna Wilson, Karma Yang, and Cynthia Zern. Dr. Tomorrow Jenkins, Assistant Principal, called the role of new inductees who were welcomed into the Chapter: Seniors Sarah Anderson, Merritt Connolly, Joseph Davidson, Eliza Fantazzi, Pathampon Moonthianngam, Sarah Ploener, Lauren Sugar, and Anneliese Werner; Juniors Lilian Alba Rodriguez, Emily Augustine, Camille Avedisian, Kassandra Ayllon, Lizette Bedolla-Zavala, Amanda Bell, Jonathan Bell, Claire Borman, Julia Bradley, Jayna Bruno, Madison Canter, Mara Castleton, Avery Chapman, Ava Charlton, Heather Cooper, Alexandra Cresci, Maya Das, Zhuanel Du Toit, Kathryn Erisman, Christopher Ferrighetto, Victoria Freire, Timothy Freligh, Emma Giancola, Holly Gouge, Molly Hohner, Mary Holguin, Alexandra Hughson, Rachel Hyzny, Rhea Jiang, Mitchell Kosara, Meredith Krieger, Kevin Lemus Moreno, Samuel Lesher, John MacMillan, Peter Magasiny, Brenna McGowan, Olivia McLaurin, Sydney Mentzer, Tamblyn Mitchell, Jack Mullen, Zoe Nguyen, Caleb Pebly, Colin Petersen, Mirella Petrillo, Davis Piercy, Noal Rasero, Hildi Reiter, Kyle Robertson, Cole Robinson, Katherine Roche, Katelin Rumbold, Erin Salameda, Joseph Schlitz, Connor Schmidt, Evan Shinn, Ananya Shivakumar, Samuel Starr, Kristina Testa, Sydney Thureen, Tamryn Whyte, Elizabeth Wilkie, Emma Yue, and Brenna Zdebski. Following the induction ceremony and roll call, Assistant Principal Raymond Fernandez administered the pledge of honor, and Dr. Tamargo announced the newly elected officers for 2018-19: President Rachel Hyzny, Vice President Tamblyn Mitchell, Secretary Victoria Freire, Treasurer Alex Starr, and Historian Rhea Jiang. Dr. Hritz then closed the ceremony and invited all to a reception in the cafeteria. Members of the Blue and White Chapter must demonstrate and maintain high standards of the four hallmarks of the National Honor Society: scholarship, leadership, character, and service. Throughout the year, National Honor Society members participate in service activities, including tutoring and fundraising. This year they have organized two blood drives for the American Red Cross, worked on volunteer crews for the Mushroom Festival, and ushered patrons at this year’s musical Fiddler on the Roof. The group is also looking forward to activities in the community this spring, particularly volunteering at the Kennett Run. Members of the Blue and White Chapter became eligible by posting a 3.75 grade point average (GPA) by the second semester of their junior year. 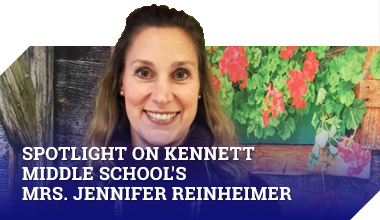 Additional qualities of character, leadership, and service were assessed by the faculty of Kennett High School and reviewed by members of the National Honor Society Faculty Council, who are chosen by the principal from among the faculty and serve for a period of two years. This year’s Faculty Council included Mr. Robert Anthony, Mr. Vincent Civiletti, Ms. Sara Donovan, Mr. Joseph Hutcheson, Ms. Heather Morihara, Ms. Amanda O’Connor, Ms. Elizabeth Richey, Ms. Chanel Ruffin, Ms. Jennifer Schmalzbach, Mr. Robert Socash, Mrs. Hannah Taylor, Mr. Frances Vanderslice, and Mr. Robert Virgin.